All of those gorgeous 80 degree days I think are finally behind us here in NJ. It is time for some fall weather to kick in. Not that that is a bad thing with temps in the 60’s. As long as the rain stays away…it will make for some really pleasant days and cool nights. And with the lower temperatures, I slowly roll on to the conclusion of my 365 Days Of Beer. 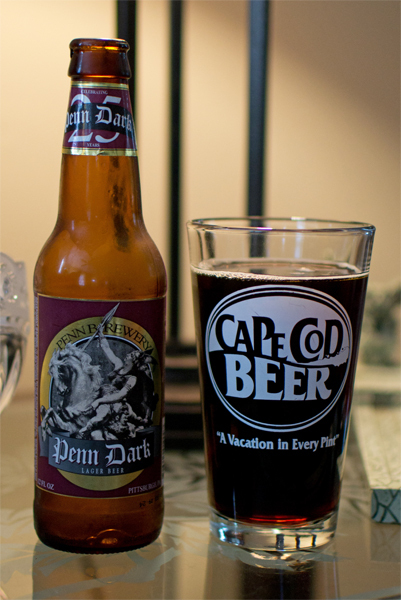 Beer #318 is Penn Dark by Pennsylvania Brewing Company brewed in Pittsburgh, Pennsylvania. Their version of a Munich Dunkel Lager has an ABV of 5%. This beer poured a dark brown with a hint of red to it when held up to the light. There wasn’t any head to speak of whatsoever. The nose was roasted malts, dark fruit like plums, and a bit of chocolate. I could taste the slightly sweet roasted caramel nature of the malts most of all her with some nice nutty flavors. The plum I got on the nose really didn’t come out in the flavor neither did the chocolate. I did get a dark bread like pumpernickel flavor throughout most of the mouthful. The body was not quite medium bordering on being light. Not really watery…just light. The carbonation was a bit on the low side and that made this quite smooth. It went down real easy. This was a pretty good beer…I think I may have a few more of these in the basement that I will have to indulge on. Beer in a can…I have only had a few on my journey towards 365 and they were really not all that bad. Quite unlike the beer in a can I can remember my dad drinking, Budweiser. We have all had beer from a can, mostly bad beer but it seems like there are a few craft brewers like Oskar Blues and tonight’s brewer, Sly Fox Brewing Company, that make decent beer…in a can…although not tonight. Beer #206 is Dunkel Lager by Sly Fox Brewing Company which hails from Royersford, Pennsylvania. 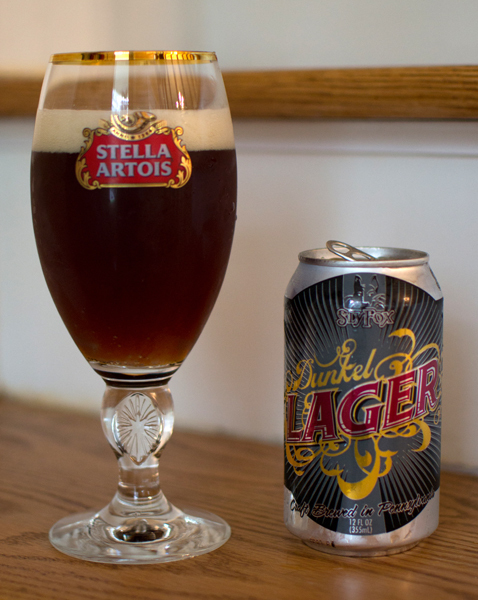 The style of this beer is a Munich Dunkel Lager with an ABV of 5.3%. A Munich Dunkel Lager is a traditional Bavarian style dark lager. Dark it was as it poured a dark reddish brown with sufficient tan head. It was mostly caramel malts nose wise. It was very light in the taste with just a tad bit sweet caramel, a bit of bread, and some grains. The finish irked me as it had a funky almost metallic taste to it. Possibly from the can? It had a thin body with and was kind of watery with low carbonation. Below average beer for sure and as much as I wanted to give it the big fat F, I held back. It wasn’t worthy of that as I feel to get an F, it truly, at least to me, has to be horrible. This wasn’t that but it was quite forgettable. On to beer #207.